Mario Cristobal had a great day on Friday. And the Ducks chose to do something about their football program that just might make for a great several years. Cristobal is the next man up, with Willie Taggart in effect a transfer after one season. Maybe that's a little harsh on Taggart, but a lot of things add up already with Crisotbal the new Oregon leader, replacing his former boss. Taggart had a smile and a handful of simple sayings. Cristobal was eloquent and efficient and concretely passionate in his first press conference as head man. It's easy to see why he has been successful in football and life, and why the Oregon players took to him immediately when he came here last year along with Taggart, who flew out of Eugene this week to take his "dream job" at Florida State. There seems to be nothing fake about Cristobal. For Oregon football, hiring Taggart was a long fly ball that sailed foul, a swing that looked like a potential home run but turned into a strike. Cristobal, at this point, seems like a solid line-drive RBI double into the gap. Good coach, good person, good recruiter. No nonsense. Well-spoken, gets his message across clearly. Communicates and connects. Cares. Leads with his work ethic and more. Gets his players to rally around him. Knows what it takes to win, on and off the field, both as a college football player and after your eligibility is up and you leave the university. And, he figures to be much more committed to Oregon than Taggart (at least until the Ducks add to their win count and a Miami or big-name SEC school come calling). It was only Day 1 with Cristobal at the helm, and I'm on the outside looking in, but this hire makes logical sense and feels good. 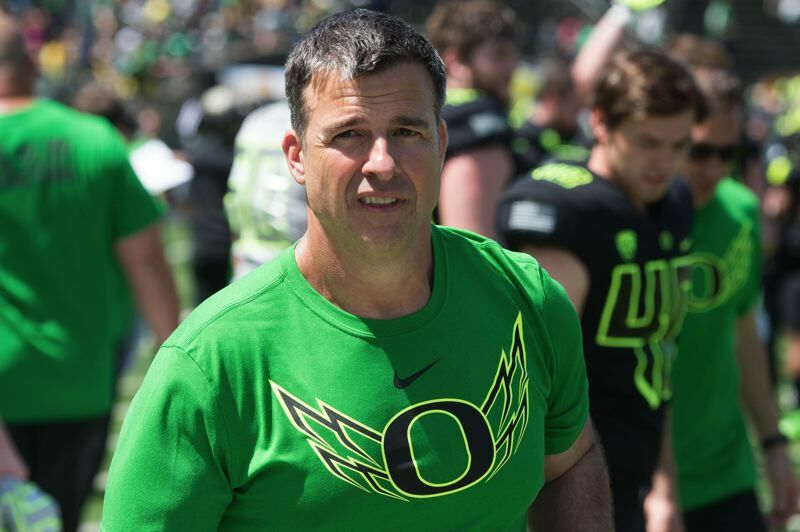 Cristobal mentioned former Oregon coaches Rich Brooks and Mike Bellotti during his press conference, and he seems to have a little of both of them in him, plus a little of former UO O-line coach Steve Greatwood and others who helped make the Ducks successful over many years. I especially like Cristobal's humility and how quick he is to talk about others and give others — his players and staff, in particular — the credit and the glory. He's got a ton of work to do in the next week, not only in putting a game plan together for the Dec 16 Las Vegas Bowl but also in recruiting and building the pieces for the future. You want to cut him some slack for Vegas, but it's obvious that this is a guy who'll have none of that. He talks about making a statement in that game — and if you weren't terribly interested before in seeing Oregon take on Boise State, you should be now. It'll be fascinating to see how the Ducks react and what they are able to do in the first game of what is a new regime, even though it's still largely intact from the days, literally, of Taggart. Looking ahead, Cristobal has a lot of smart minds to coach against in the Pac-12. The conference has a lot of teams with talent, and Oregon still has a fair amount of catching up to do. But I think for the Ducks picked a coach who gives them a fighting chance. Cole Kehler, Portland Winterhawks goalie, has signed a three-year, entry-level contract with the NHL Los Angeles Kings. Kehler ranks second in the Western Hockey League this season in goals-against average (2.2) and save percentage (.931) and is tied for first in wins with 17. Canada is in his fourth WHL season and second season with the Hawks. His combined record is 53-39-2-4, with a 3.34 GAA and .901 save percentage. By the end of December, Portland will have played 35 of its 82 regular-season games. Best home games remaining this month? Houston on Saturday, and San Antonio on Wednesday, Dec. 20. Most interesting road games? At Golden State on Monday, at Minnesota on Dec. 18, and at the Los Angeles Lakers on Saturday, Dec. 23. The Dec. 30 game at Atlanta starts a three-game swing that includes a Jan. 1 date at Chicago and Jan. 2 visit to Cleveland.